The flag is white, with a solid six-pointed star in blue overlapping the letters WJC. Embraced by the C is a gold globe. The organization's name is written in gold in English (above) and Hebrew (below). Here is a photo of the flags in use. The World Jewish Congress is a political organization whose membership is composed exclusively of representatives from organized Jewish communities in countries around the world. Although it is not a specifically religious organization, among its concerns are and have been any infringements of the right of Jews to practice their religion as well as to participate fully in various social, cultural, and educational activities which are related both to the practice of the Jewish religion and to the right to live a secular, albeit Jewish, life. 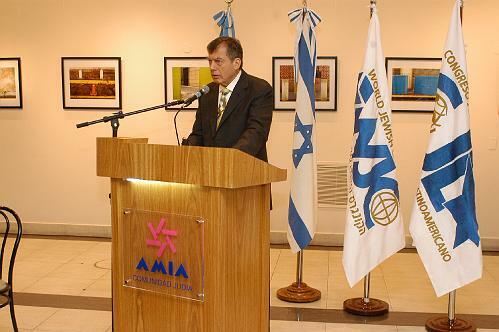 It also is concerned with mobilizing a global response to anti-Semitism wherever it may occur. Different Jewish communities around the world choose their delegates to the WJC in a number of ways, including election by members of representative Jewish organizations within a given country and nomination by Jewish communal, religious, and political leaders, among others. The flag is similar to the English version: white, with a solid six-pointed star in blue, here inclined, overlapping the letters CJL. Embraced by the C is a gold globe. The organization's name is written in gold in Spanish (above) and Portuguese (below).